Players earn Old Bottle Caps by completing the account-wide weekly quest, Pet Battle Challenge: Deadmines. Deals 492 Critter damage and removes any objects on the battlefield. You can now relesae this pet if you get to 3 and want to try for another breed. This rat comes in 3 breeds. S/S, P/S, and S/B. Like @Vakeetah says, it's just a rat except for the new and unique move Sniff Out which is basically just a critter version of Clean-Up. At this point in the development (July 2017) you might never get the breed you want because once you add him to your pet journal, you cannot remove him. PvPers as well as everyday pet battlers will enjoy the 341 speed on the S/S version. 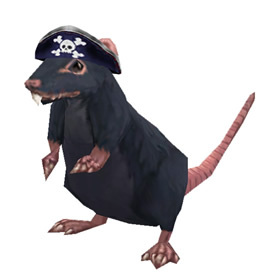 Tricorne is, for the most part, your average Rat... with a hat! In terms of battle, the only thing it offers over regular rats is the new move Sniff Out (a Critter-version of Clean-Up) which gives it a hard-hitting move with some niche utility. UPDATE: Turns out this pet is excellent for removing the infamous Magma Trap! Despite triggering the trap in the process, Tricorne is immune to the stun and resistant to its damage. He'll plunder your provolone, turn your ship to swiss, then get your gouda. He's a true muenster and the scourge of the seven bries.